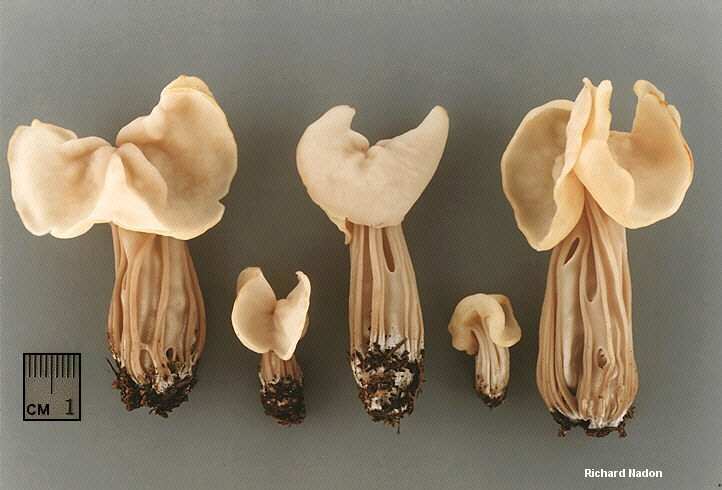 This astonishing mushroom is easily distinguished by its creamy white colors and its ornately fluted stem; it looks like something on the set of The Lord of the Rings. 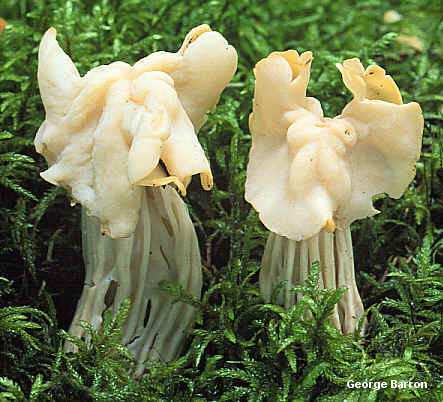 The undersurface of the cap is densely fuzzy, separating Helvella crispa from Helvella lactea, which is also whitish but features a smooth undersurface. 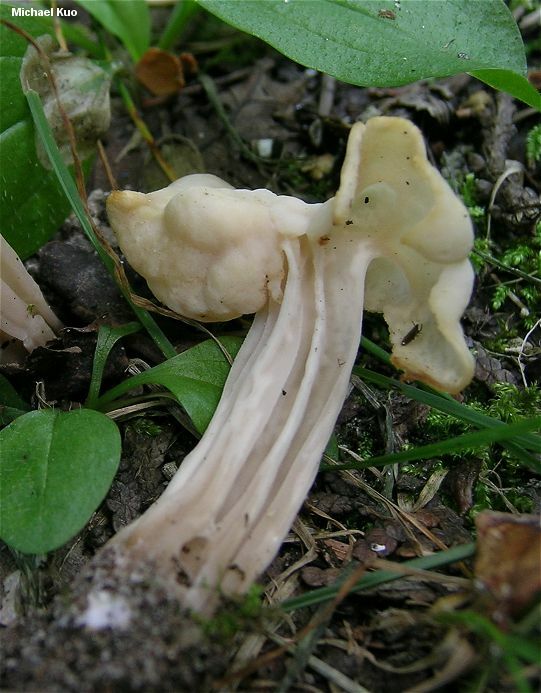 Casual research does not uncover the origin of the sometimes-applied common name "Elfin Saddles" for species of Helvella, but the name certainly applies in the case of Helvella crispa. 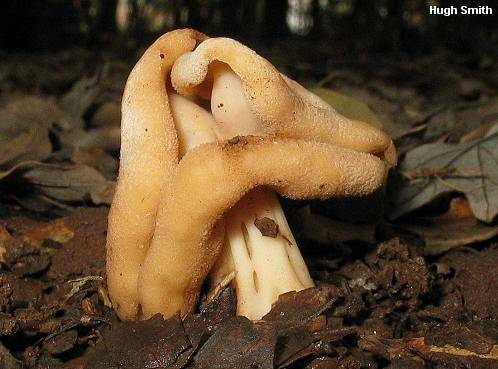 The original name for the genus, provided by Fries, was Elvella, and the genus also included some of the species now placed in Gyromitra. The term "elfin saddles" is not used in any of the turn-of-the-century books in my library, nor in works published in the first half of the 20th Century. Arora (1986) uses the term to refer to the genus Helvella, but Weber (1995) applies the name "Elfin Saddle" to Gyromitra infula. Ecology: Probably mycorrhizal; growing alone or gregariously under conifers or hardwoods, on rotting wood or terrestrially (often in disturbed-ground locations); summer and fall, or over winter in warm climates; widely distributed in North America but more common in northern North America and in California. Cap: 1-5 cm; saddle-shaped and/or irregularly lobed; surface bald and smooth or slightly wrinkled; white or, more typically, creamy to yellowish; undersurface finely hairy (use a hand lens), colored like the upper surface or slightly darker; the margin often curled upwards, and usually not becoming fused with the stem where contact occurs. Flesh: Thin; brittle; often chambered in the stem. 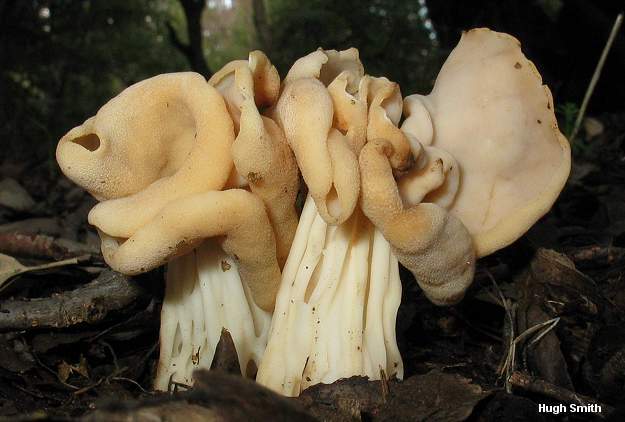 Stem: 3-10 cm long; 0.5-3 cm wide; white or flushed slightly pinkish; deeply and ornately ribbed, with cross-veins and pockets. 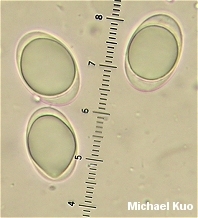 Microscopic Features: Spores 16-21 x 10-14 µ; elliptical; smooth; with one large, central oil droplet and, sometimes, several smaller droplets at each end. Asci 8-spored. Paraphyses cylindric with clavate apices; hyaline; 5-12.5 µ wide. REFERENCES: (Scopoli, 1772) Fries, 1822. (Saccardo, 1889; Weber, 1972; Smith, Smith & Weber, 1981; Arora, 1986; Phillips, 1991/2005; Lincoff, 1992; Mezler & Mezler, 1992; Abbott & Currah, 1997; Barron, 1999; Roody, 2003; McNeil, 2006; Miller & Miller, 2006.) Herb. Kuo 09120501.